If you are using jump breaks on your posts, you may like to give it more color to be match with your blog design as you prefer. Converting jump break link to a image is not a big deal or it doesn't increase pageviews for your content. But it's all about designing of your blog. You can add more color to your blog and let your readers find it very interesting by using a meaningful image instead of standard jump break hyperlink. If you wanna convert your jump break into an image, proceed with steps below. 1. Select an image you would like to use instead of jump break hyperlink. 2. Upload that image to an image hosting sites like Picasa, Flicker or on preferable hosting site where you can access it easily. 3. Copy URL of your uploaded image. 4. Go to Blogger Dashboard. 5. Click on your Blog Title. 7. 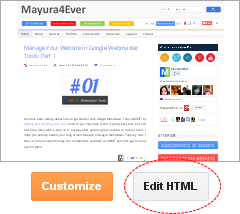 Now click Edit HTML button. 8. Find below code in your template. 9. Now add following CSS style just before the line of code you have found in previous step. - This enables border for image. Set 1 to enable border, 0 for disable border around the image. - This line enables you to change the alignment of the jump break link by changing right side value of it. Right and Left are the possible values. - This line specify the gap between margin and your Jump Break Image. 10. Now search for code below in your template. 11. Replace the line of code you found in previous step with below line, after adding the URL of your image. 12. 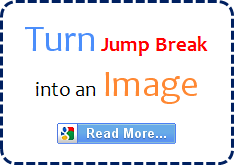 Preview your blog and confirm the customization for Jump Break.